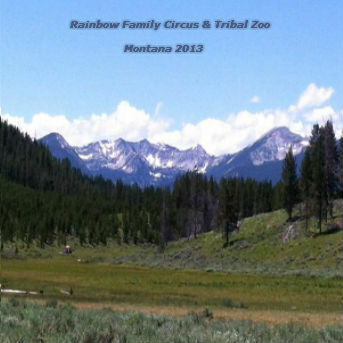 The 2013 Montana gathering was held near the town of Jackson, Montana, in the Beaverhead National Forest. We reused the same site from 2000, some even went as far as calling it the Montana remix gathering. Kitchen duties kept me from actively recording but I did manage to document part of the July 4th Variety Show at Granola Funk Theater, as well as, some audio snippets on July 5th near Rough and Ready Kitchen. All in all, I compiled 21 songs, poems and various ambiance. Sometimes life reveals a full circle… Saginaw Creek is a wondrous place, an idyllic and rugged setting, it is also where I first started field recording. And despite my limited effort this go around, it was really special to take part in where my field recording journey began, though this time with an added touch of reflection and déjà vu. Once again I’m reminded how challenging and difficult it is to record nestled in some craggy valley at the mercy of the elements, yet somehow, someway you roll the dice of chance and a few gems do appear.